Khanalizadeh, M., Najafian, M. (2014). The Effect of Vitamin E and Selenium on Cyclophosphamide Detoxification in Hepatic Tissues of Mature Rats. International Journal of Advanced Biological and Biomedical Research, 2(4), 1406-1413. Mojdeh Khanalizadeh; Mahmood Najafian. "The Effect of Vitamin E and Selenium on Cyclophosphamide Detoxification in Hepatic Tissues of Mature Rats". 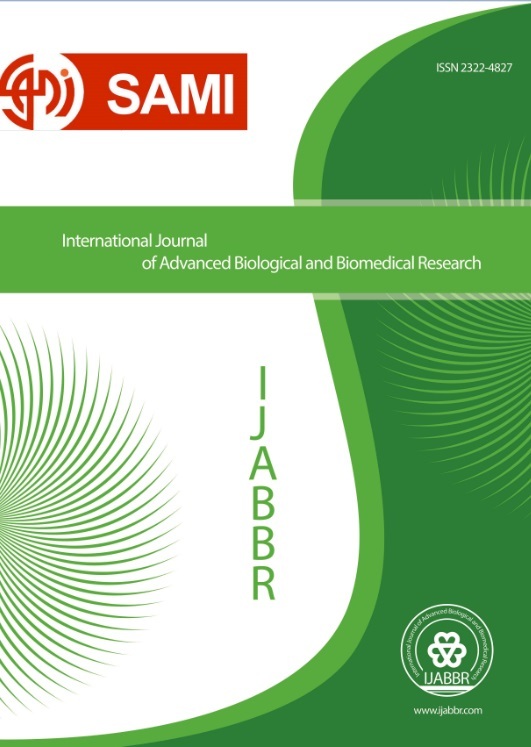 International Journal of Advanced Biological and Biomedical Research, 2, 4, 2014, 1406-1413. Khanalizadeh, M., Najafian, M. (2014). 'The Effect of Vitamin E and Selenium on Cyclophosphamide Detoxification in Hepatic Tissues of Mature Rats', International Journal of Advanced Biological and Biomedical Research, 2(4), pp. 1406-1413. Khanalizadeh, M., Najafian, M. The Effect of Vitamin E and Selenium on Cyclophosphamide Detoxification in Hepatic Tissues of Mature Rats. International Journal of Advanced Biological and Biomedical Research, 2014; 2(4): 1406-1413. Introduction and Objective: liver is an important body organ without which life is impossible. Cyclophosphamide is an alkylating agent widely used as an anti-cancer (“antineoplastic” or “cytotoxic”) chemotherapy drug. The present study aimed to find a suitable antioxidant and examine the effect of vitamin E and selenium on reducing the side effects of cyclophosphamide on liver as a vital organ. Materials and Methods: in this experiment, 42 mature female rats were divided into 6 groups. The control group did not receive any drug or solvent. The first experimental group received 1 mg / kg-B.W sodium selenite as intraperitoneal injection. The second experimental group received 200 mg / kg-BW 200 vitamin E orally. The third experimental group received 5 mg / kg-BW cyclophosphamide as intraperitoneal injection. The fourth and fifth experimental groups respectively received 5 mg / kg-BW cyclophosphamide as intraperitoneal injection in a daily manner and 1 mg / kg-BW 1 sodium selenite as intraperitoneal injection and 200 mg / kg-BW 200 vitamin E orally for 21 days. The hepatic tissue slides were prepared and examined. Results: the hepatic cells were normal in control group. No difference in hepatic tissue was observed in the first and second experimental groups. Cellular necrosis was observed in the third experimental group. Destruction of hepatocytes in hepatic cells was highly observed in the fourth and fifth experimental groups compared to the third experimental group. Furthermore, congested blood sinusoids and lymphocyte infiltration was less observed in the fourth and fifth experimental groups compared to the third experimental group. Conclusion: Cyclophosphamide cause damage to hepatic tissues with different mechanisms such as production of reactive oxygen species. Vitamin E and sodium selenite relatively reduce negative effects of cyclophosphamide.